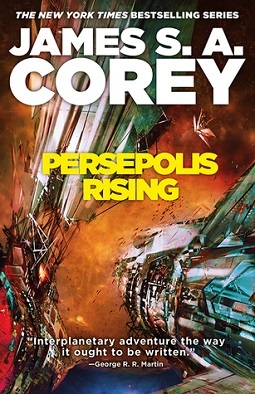 Persepolis Rising is a science fiction novel by James S. A. Corey, the pen name of Daniel Abraham and Ty Franck, and the seventh book in their series The Expanse. The title of the novel was announced in September 2016 and the cover was revealed on December 12, 2016. Thirty years have passed since the events of Babylon's Ashes and Earth is back on its feet after the attack that crippled the planet in Nemesis Games. The crew of the ageing gunship Rocinante are still together, working contracts for the Transport Union, who have control of the Ring station and the 1,300 worlds the gates lead to. No one has heard from Admiral Duarte and his rogue fleet in the thirty years since they broke away from the Martian Congressional Republic Navy, until now. They have spent their time in the Laconia system building an advanced fleet using leftover technology from the protomolecule creators. They return through their gate to take over Medina Station and launch an attack on the Sol system. James Holden, aging Captain of the Rocinante, after over 30 years of working the Rocinante, Holden looks to the next chapter of his life, retirement. Until the Laconians return through the gate and Holden is drawn back in to the fray. Bobbie Draper, former Martian Marine and now working on the Rocinante. When Holden retires, Bobbie takes up the mantle of Captain of the Rocinante. Camina Drummer, former head of security at Tycho Station, now the president of the Transport Union. The Transport Union's control of Ring station, and the 1,300 worlds it connects to, makes Drummer one of the most powerful people in all of humanity. Santiago Jilie Singh, a Captain in the Laconian Navy, recently promoted to command The Gathering Storm. After the Laconians take Medina Station, Singh is appointed as the governor of the station. Naomi Nagata, one of the best engineers in the solar system and XO of the Rocinante, she is looking forward to a quiet retirement alongside Holden, until the Laconians return and Naomi gets pulled in to the resistance with the rest of the crew of the Rocinante. Alex Kamal, pilot of the Rocinante, after another failed marriage, and a son who is in university, Alex is still at the helm of the Rocinante, with no plans of leaving. Amos Burton, mechanic on the Rocinante, still very close friends with Clarissa, Amos has become her caretaker as her health is declining. Clarissa Mao, daughter of the disgraced Jules-Pierre Mao and former prisoner on Earth, now a mechanic on the Rocinante alongside Amos. Clarissa's health is deteriorating due to the body modification implants she got over thirty years ago, during her quest to destroy Holden and restore her father's good name. Paolo Cortázar, a former member of Protogen's nanoinformatics research division who was a prisoner of the OPA after the raid on Thoth Station. He was released by rogue members of the OPA, and has been working with the rogue Martian fleet under Admiral Duarte ever since. He is the lead researcher on Laconia and is working on making Duarte immortal using protomolecule technology. Winston Duarte, was an admiral in the Martian Congressional Republic Navy, until he and a splinter group broke away from Mars and went through the ring gate to the planet Laconia. Duarte learned of Laconia and the vast amount of protomolecule technology that was left behind by the creators through his position at the MCRN, and felt that it needed to be acquired and understood, in the event that the race that destroyed the protomolecule builders returned. ^ Corey, James S. A. (28 September 2016). "Some people seem to get angry that it's hard to make things and it takes time to do it. However, we're 2k words in Persepolis Rising now". ^ "Cover Launch: PERSEPOLIS RISING - James S.A. Corey". 12 December 2016.